You can – both when eating out or in supermarkets near Lake Tisza Holiday Homes in Tiszafüred (Hungary) – obtain all the types of drinks that we know over here: water, soft drinks, beers, wines and spirits. Of course the brands do not always match, but the choice is equally as rich, and big international brands are plentyful. As far as coffee is concerned this is of the same quality as over here, but do remember to order a “large coffee” if you do not want to end with a small espresso. The range of beers on offer includes import from “the West” (the same brands you can find anywhere at holiday destinations), but there are some excellent Hungarian breweries. The most common blonde beers offered (barrel, bottle or can) are Borsodi, Soproni and Arany Ászok. There are also “dark” variants like the slightly sweeter Soproni Demon. In general, the Hungarian beers are slightly less bitter than the Belgian ones, but with a great taste and aftertaste. With the exception of Bulgaria you can nowhere in Europe buy a cheaper pint than in Hungary: in Tiszafüred on the terrace of a bar it will cost you about 1.2 Euros for a pint. Hungary is also a wine country par excellence and you will – both in supermarkets and in the bars – find a wide choice. The world famous “Bull’s Blood Wine” can be viewed here, and of course we also mention the other great Hungarian wine Tokaj, whose vineyards are located northeast of lake Tisza and irrigated by the river Tisza. 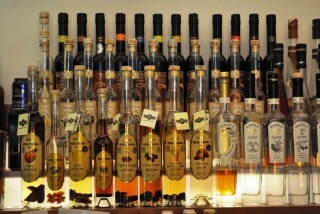 All types of spirits are sold everywhere, but the real Hungarian keeps to his Palinka, a strong fruit brandy (40 ° commercially, 52 ° privately made …) which you will surely enjoy. Very delicious as a pousse-café!